Take your time getting to know Northern Laos on this Tiger Trail trip through some of its most beautiful places. You’ll hike through rich jungle-covered mountains for which Nong Khiaw is famous, trek the famous 100 Waterfalls tour, homestay with traditional ethnic tribes, and take in the grandeur of the landscape from a riverboat up and down the Nam Ou River. In the morning, you can relax on a scenic drive along the Nam Ou River north to Nong Khiaw, 3 hours north of Luang Prabang. 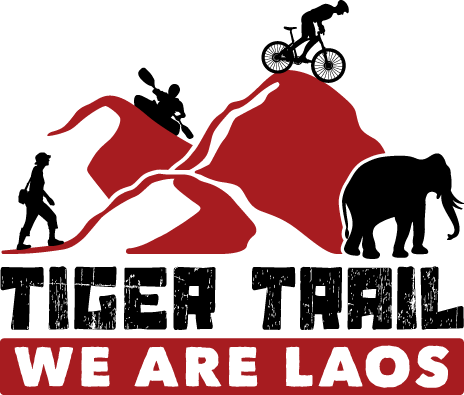 Along the way, we’ll stop at a Lao Leu weaving village* to explore a less familiar style of homes and culture. Take lunch in Nong Khiaw with your guide and then explore the area with your choice of a trek to a local viewpoint or a visit to the Phatok Cave. The Mountain View Trail takes about 3-4 hours walking round-trip up to a viewpoint. From the top, you can see as far as 20 km and enjoy a panoramic view of the surrounding landscape. Alternatively, you may choose to visit the large and easily accessible Phatok Cave where locals took shelter during the war. The cave is large and has numerous relics of wartime past. You’ll spend the night comfortable guesthouse on the banks on the Nam Ou River. Note: You may choose between public or private minivan transfer from Luang Prabang to Nong Khiaw on the first day according to your budget and preference. Starting the day with a peaceful boat ride through stunning mountains on the Nam Ou, you will be able to explore a small Lao village along the river side before heading into the waterfalls. Learn about their way of life along this river! Walk through small streams and rice paddies to reach the 100 waterfalls which were first discovered by Tiger Trail! The next few hours you will see only water and jungle and hear the sound of clear waterfall cascades…small pools all around you inviting for a refreshing splash. A local style lunch is served at the falls. Arriving on top you have a great view over the landscape and nature of the region! Rated to be the best value adventure hike in Luang Prabang province! Our return hike will take us to a Khmu village where we will overnight for a homestay experience on the banks of the Nam Ou River. Start the morning with an upriver boat ride to Muang Ngoi through lush jungle and mountains. An amazing and truly fantastic landscape is waiting for you today. In the afternoon, have time to explore the little village of Muang Ngoi. We’ll take a walk through a valley to explore a historic cave and Ban Naa Village with its expansive rice paddies and agrarian lifestyle. A peaceful place, Muang Ngoi is ideal to relax and enjoy the lifestyle of North Laos. We stay overnight in the Lattanavongsa guesthouse. After breakfast we’ll leave Muang Ngoi by small boat and cruise to Nong Khiaw. If desired, we will have a short stop over here before we start our way back to Luang Prabang by private minivan. On the return drive to Luang Prabang we’ll take an excursion to visit the famous Buddha caves of Pak Ou and the Whiskey Village, Ban Xiang Hai. Arrive in Luang Prabang in the late afternoon. Importantly, bring trekking sandals or shoes that can get wet as you walk through the 100 Waterfalls. Mentioned hotels and guest houses depend on availability. Comparable accommodations will be arranged when not available.